In many societies males like to live as men who go to work and bring money to the family. On the other hand, women who are response to do the house work such as cooking, cleaning, and take care of the children. Many countries are agreed with this idea of men who are suppose to work and women has to take care of them. However, this idea is completely wrong in some countries especially in Soma (Polynesia). Men who chose to live as women and do the women work. I found and an interesting topic about fa’afafine in Samoa society. Men in soma admire and appreciate to live as women. It is hard in many societies to believe in that men can live as women, but is not hard for boys and men who live in Samoa to adore living as fa’afafine. It is hard for any man who does not live in Samoa society to accept the idea of being fa’afafine. There are many reasons that made Samoa society to raise their males as females such as assist the helping the mother in the housework, have a great value of being fa’afafine, and enjoy the popularity in Samoa society. Fa’afine has a great valued in Samoa society. Being fa’afafine does not mean they do women’s jobs only, but they also can work as men too. It is really intersecting in this culture of men who works really hard and enjoy this life. Also, when their parents ask them to live as girls and help their mothers in the housework, they obey and are happy of helping their mother in cleaning, cooking, and washing. In addition, they don not only help their mother, but they help the old people such as their grandparents. All these careers any man can done it in Samoa society if he living as fa’afafine. It is not acceptable in other culture for men to do a woman’s job. However, it is a grate idea in Samoa of having the idea of fa’fafine and raising some of their sons as girls to assist the mother. By having this idea in this society and thinking of the mother who needs their helped, that gives the women most attention in other societies. If any country tried to apply the idea of fa’afafine instead of homosexual, that will benefit our society and decrease the problems between men and women about who is suppose to do the house work. Having this thought of helping the women their work. 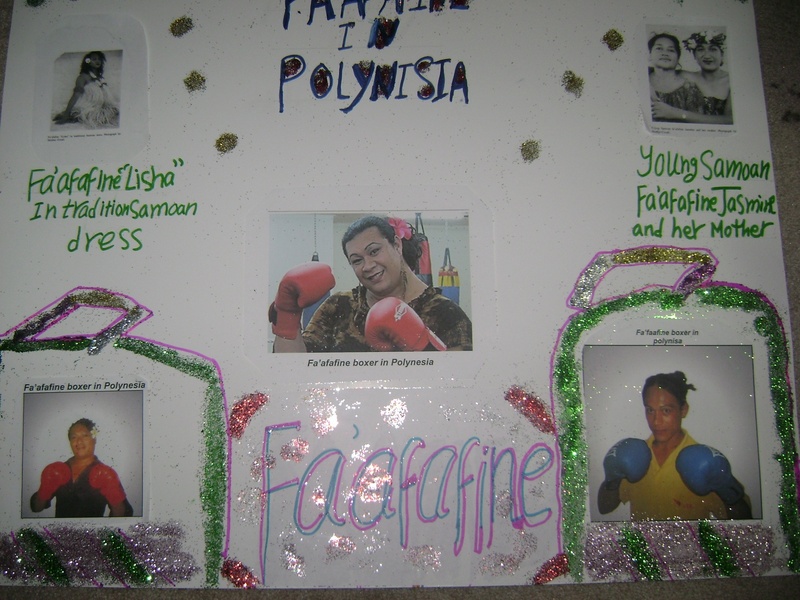 Being Fa’afaine is to help and assist the mothers and do the women jobs where girls are not enough in Samoan society. Paradise Bent 1999,51 minutes color, video by Heather Croall. The film subtitle boys will be girls in Samoa. The democracy begins with footage taken in Ta’o village in the somewhat remote Manu’s island group of American Samoa. In 1960 represent the old life in Samoa. The rest of the film mentioned about the western Samoa and shows the impact change of modern setting in regard to a particular kind of gender that called fa’afafine (the female way) phenomena. As practiced by men transvestites, The tradition role of fa’afafine who can found in many families of Samoa involves doing women’s work such as washing, ironing, sewing, bay tending, and caring of the elderly. The film also discuss the importance of this of role, and how the male who live as fa’afafine tend to be highly valued because they can do the heavy kinds of labor that women find difficult. (Lowell D. Holmes “Paradise Bent” by Heather Croallp604). Eventhoug,fa’afaifne has many advantages especilly in Samoa societies,it has also some negative things.How forunite is to have a fa’afafine in the family to asssite with household chores.An eldrly chief who doesnot like the fact that fa’afafine wear women’s clothing and paint their facees.As we can see in may pictures of fa’fafines wholook like a women with long hair and the preetty face and flierty dresses.Therefore, the picures that I choose represent the men who live as fa’afines.Some of them are boxer, another is in a picure with their mom,and a picure of a fafinfe by himself.The film show how fa’afafine are nice,but they do not need to wear the woomen clothes or wear make-up to look as female.In additon, in the film there are inforamtion about the life of fa’afafine and how they are like to helpe everybody in the their familyy especilly the mother. One information of the film maintained that today there aere “culture fa’afafines and a city kind of fa’fafines”.Much of the film deal with latter type.For example,Some inforamtion came largly from a person ,af’afafine who works as a disc jokey as well as a nightclub chorus.She or he describe that behavior of a star performer.Cindy, who was livivg at the time with austrialline governrment offical.One day she perform the duties of a housewife and describes herself as happy because the austrrrian relaly loves “her”and protctin “her.”They are a happy couple .In afct the fa’afafine donnot consider them “gay,”they do refer themselves as “queens” which apperas to suugest that they consider themseves transvestitles. Fa’afafines never have sexual realtions.Another voulntered that 99.7% of men have had sexual realtions with fa’affine. The film mentioned that being af’fafine and dress like woman is better than the homosexual in the united states.That will make the idea of fa’affaine more accepatble in other culrures.The film reveals that fa’afafines are rligionn church regllary .A poster’s wife said that “God made me for taking care of her family,and fa’faifne relted to an athetic teams and some as coachs. ( Lowell D. Holmes “Paradise Bent” by Heather Croallp605). Fa’afafine is very popualr for many people in samoan’s culture.For instance,there are may males who rasised as girlls(fa’afafine) they continue to live the rest of thierlife as fa’faine.Since fa’fafine is more common in their societ and they get respect and appreciate from people because they are an example of the hard workers.Therfore,those men continue to live their life as fa’afafine and enjoying their life.The governer of samoa appricate those men who arenot ashame to live as fa’afafine or to do the house work.Nevertheless,they will be happy once they grow up to continue to live as fa’afafinbe.It is a graet culture that give the women a great apportunity to find people who are care her and think about her needs.There are many countries who still think that man who has to work and woman who has to do all house work no matter what.this is completely wrong man and woman are the same,so they can hep each other in their needs.If some countries starte to look around the world about the polynisa’culutyre,they would know how agraet and happy Samoa culture.